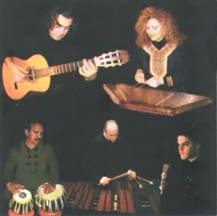 In order for our diverse backgrounds and different musical styles to merge into one homogeneous entity we had to "probe" into many other styles of music which include Spanish gypsy, American jazz, Gamelan music of southeast Asia, Afro Cuban rhythms, and Raga and rhythmic cycles of India. Both of us have enjoyed our collaboration immensely and hope to continue the journey we started only recently. Musicians: Said Amintinat (guitar), Roya Bahrami (santur), Barry Dowe (percussions), Humayun Farzad (vocals), Debu Nayak (tabla). For more information go to: www.probemusic.com.